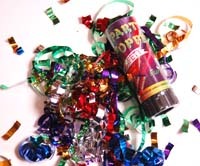 Confetti Poppers. Indoors or Outdoors use. Spring action loaded so there is no powder. Twist the bottom and watch the confetti fly up to 6 meters (almost 20 feet).